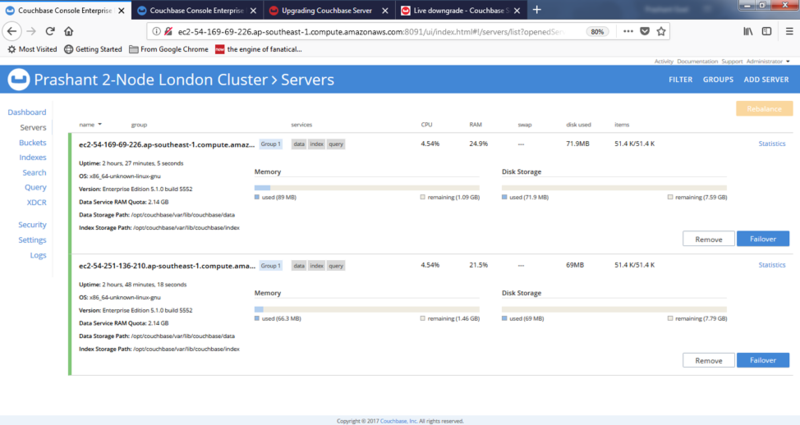 There are many approaches to upgrading a multi-node Couchbase® Server cluster. 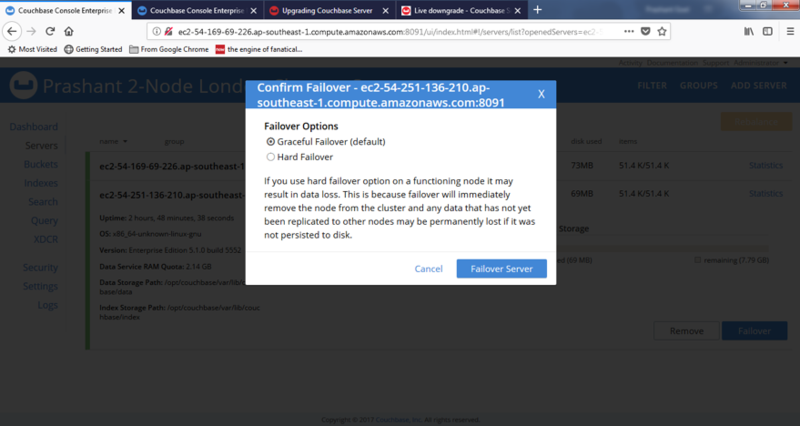 This post describes detailed steps for the rolling online upgrade by using the graceful failover and delta recovery method. 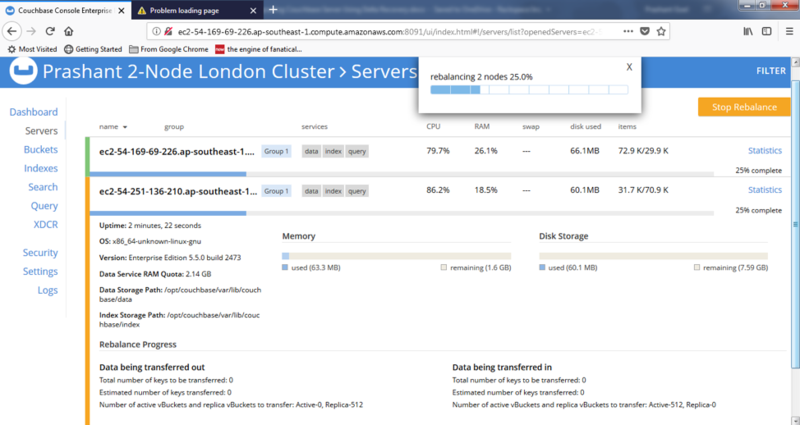 The method described in this post is one of the most preferred methods for online upgrades because it does not require adding any additional nodes to the cluster for the upgrade. The method is fast and less resource intensive because the node is recovered by using only delta changes instead of a full rebalance. Also, the global secondary indexes are preserved in this process, which does not require a rebuild. The primary disadvantage of this approach is decreased high availability for the duration of upgrade. You should perform this upgrade during off-peak business hours. There are also certain requirements and considerations for using the graceful failover. Review this setup document before proceeding with the steps outlined in this post. 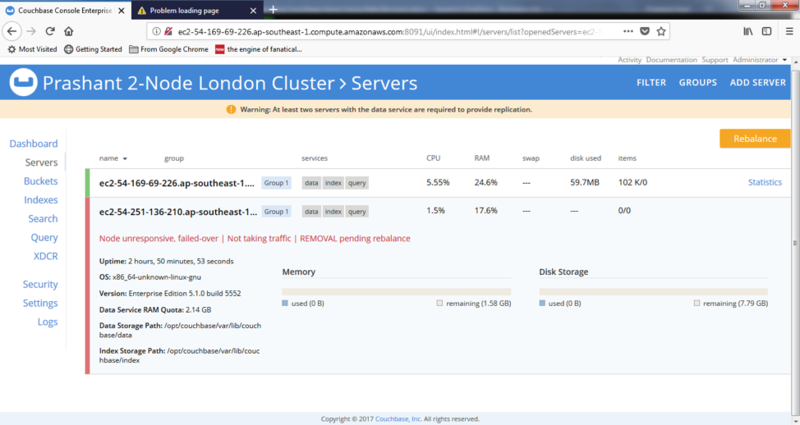 It has a two-node cluster Prashant 2-Node London Cluster. It upgrades Couchbase Enterprise Edition version 5.1.0 build 5552 to Couchbase Enterprise Edition version 5.5.0 build 2473 - IPv4. 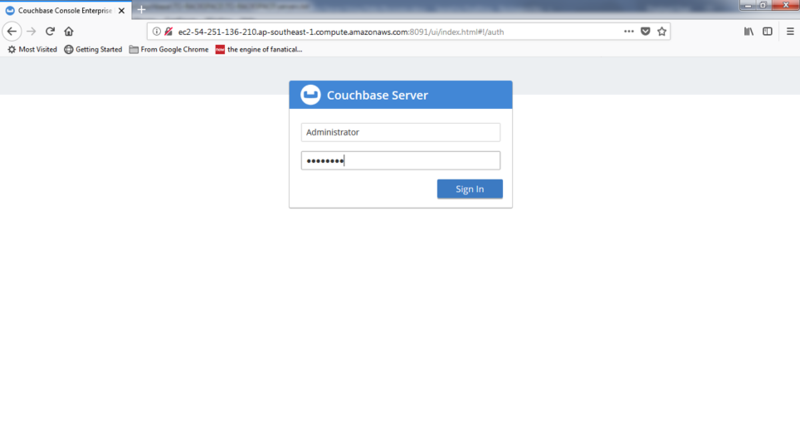 It uses the Couchbase Administration Web Console for most of the steps. Use the steps in this section to perform the upgrade. 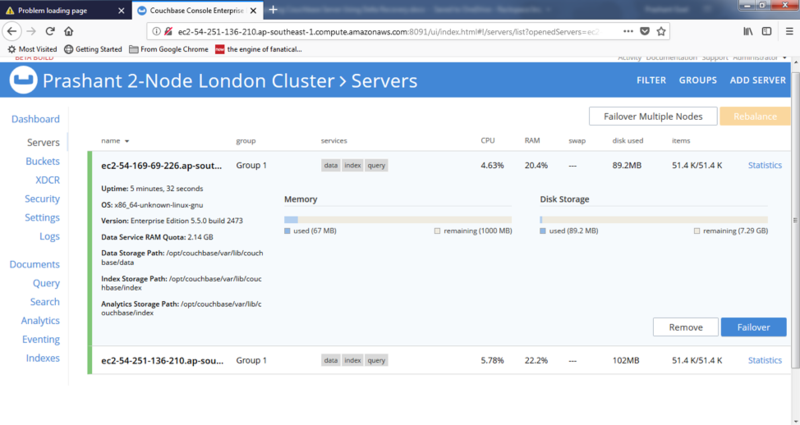 Download the Couchbase version 5.5 binary executable on the first of the cluster nodes. The following image uses the WGET utility to download the required RPM Package Manager (RPM) file from the server. 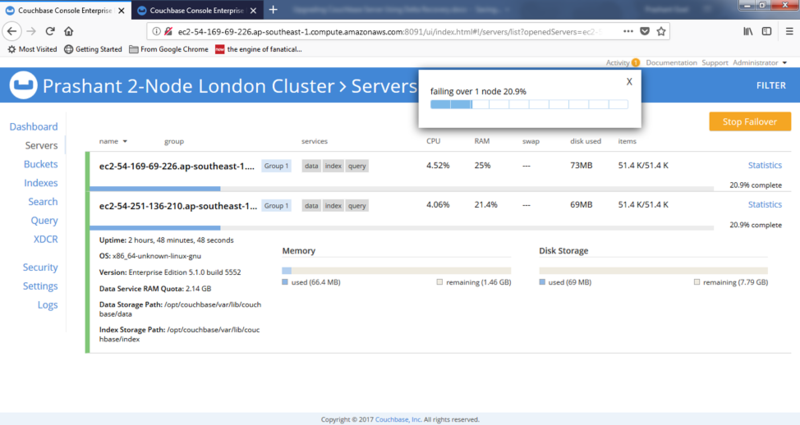 Repeat the download process for the other node of the cluster. Because you logged in from node-1, you need to upgrade the other node, node-2, first so that the Couchbase Web Console session remains intact even after the Couchbase shutdown during the upgrade. The time it takes for the graceful failover is directly proportional to the number of vBuckets that are required to be activated or synced to the surviving node. 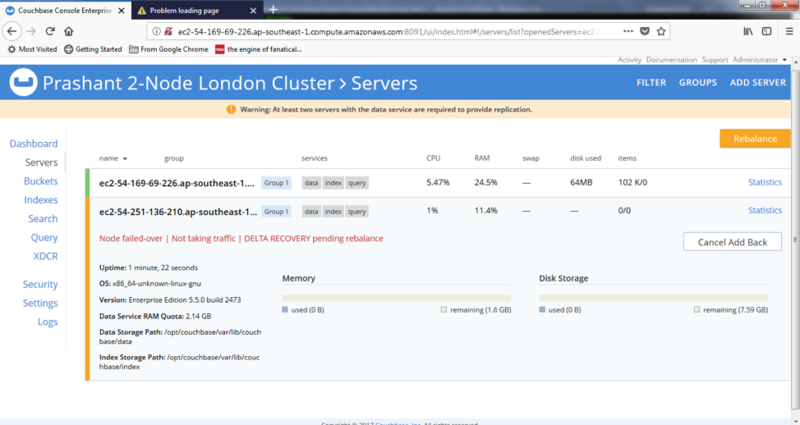 If you select Hard Failover instead, the vBuckets are not synced and eventually you would need to use Full Recovery instead of Delta Recovery after the software upgrade. Upgrade the existing version 5.1.0 installation to 5.5.0 by applying the binary that you downloaded in Step 1 as shown in the following image. Because this is not a fresh installation, use the --upgrade option of the RPM command. If you wanted to uninstall version 5.1.0 and then install 5.5.0 (instead of using the --upgrade option), you would need to do to use Full Recovery instead of Delta Recovery after the software upgrade. Click on Add Back: Delta Recovery. The status changes to DELTA RECOVERY pending rebalance as shown in the following image. In this step, you are just telling Couchbase which recovery mode to use, not actually kicking off the recovery. 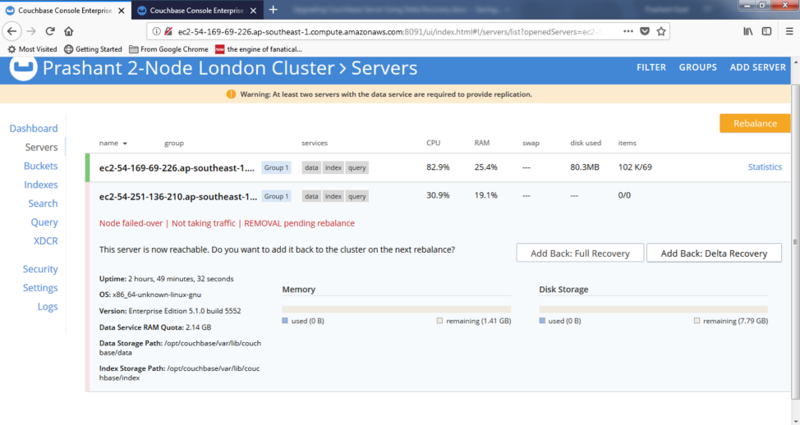 Click Rebalance to sync the upgraded node to the cluster. This should go quickly because it's a delta recovery instead of a full recovery. Now that you successfully upgraded node-2, you need to upgrade node-1. 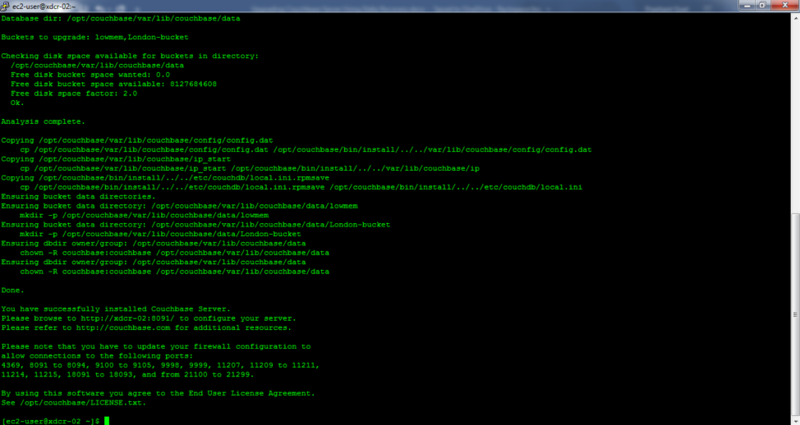 First, log in to the node-2 Couchbase Web Console as Administrator and repeat Steps 5 to 9 for server node-1. Note the following two new options on the left side menu, which are new in Version 5.5.0. Analytics: Enables execution of familiar SQL queries by using N1QL for analytics. Eventing: Enables creation of server-side functions, which are triggered by using the Event-Condition-Action model. The graceful failover and delta recovery method is an excellent option in Couchbase rolling upgrades. 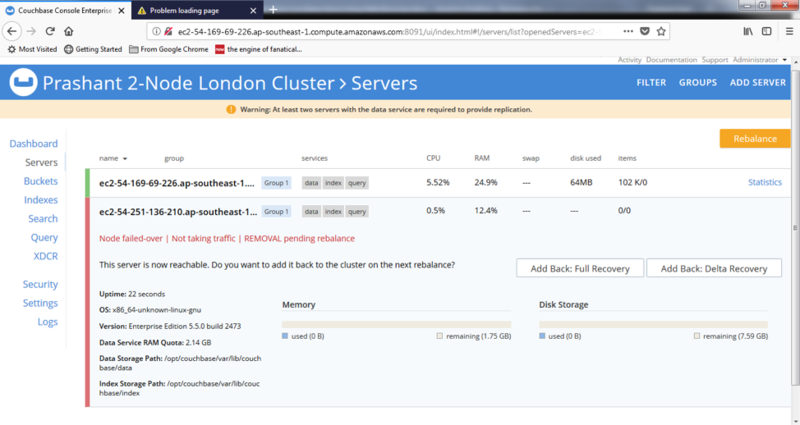 For a very large database cluster spanning across many nodes, full recovery of each upgraded node can be a nightmare. 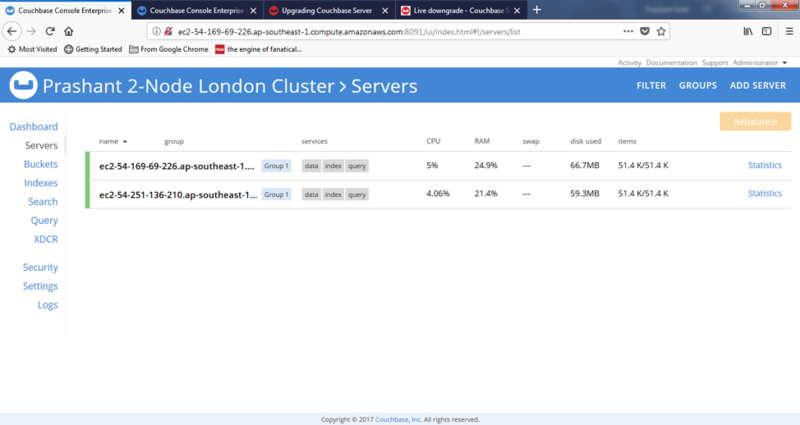 By failing over gracefully, Couchbase gives us the option to add back the upgraded node by syncing only the changes that took place during the upgrade. This is significantly less time consuming. 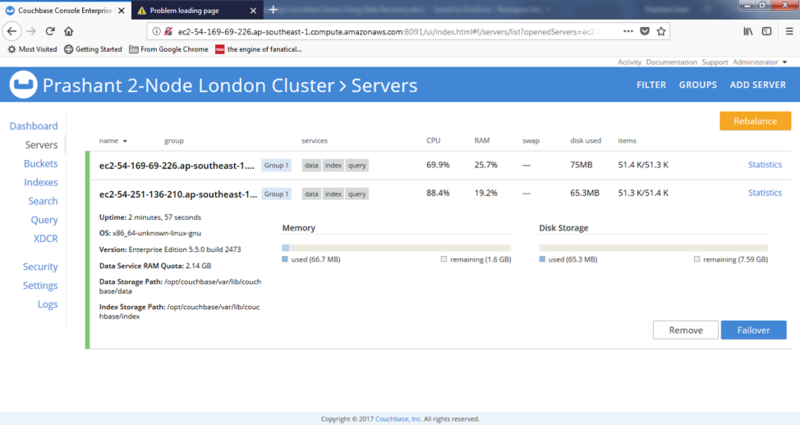 Also, for interactive database applications that have many Global Secondary Indexes (GSIs), this is a favorable approach because the GSIs are preserved and do not need to be rebuilt, which saves resources and reduces upgrade time. To take maximum advantage of this approach, the upgrade should take place in off-peak hours. This addresses the only shortcoming of this approach (decreased high availability) and speeds up the upgrade because the delta changes will be much fewer during off-peak hours.